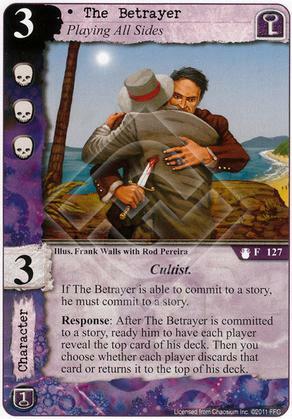 While attached character is committed to a story during your turn, you decide the order struggles resolve at that story. 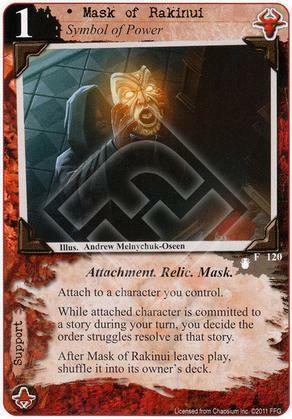 After Mask of Rakinui leaves play, shuffle it into its owner's deck. "What... what is that? How in the world is it moving?!" 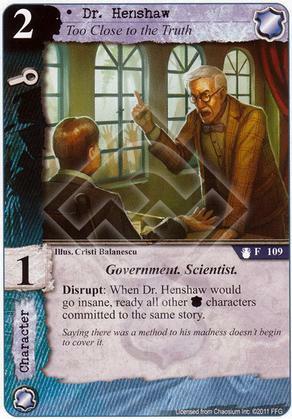 Disrupt: When Dr. Henshaw would go insane, ready all other [The Agency] characters committed to the same story. Saying there was a method to his madness doesn't begin to cover it. Response: After an opponent succeeds at a story, wound attached character. He had been told it would be an easy assignment. A working vacation. 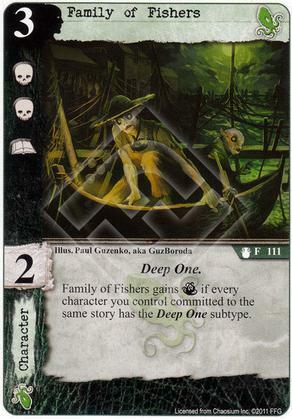 Family of Fishers gains [Terror] if every character you control committed to the same story has the Deep One subtype. 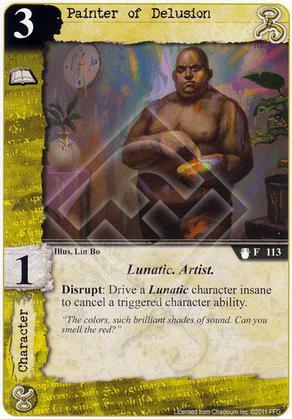 Disrupt: Drive a Lunatic character insane to cancel a triggered character ability. "The colors, such brilliant shades of sound. Can you smell the red?" 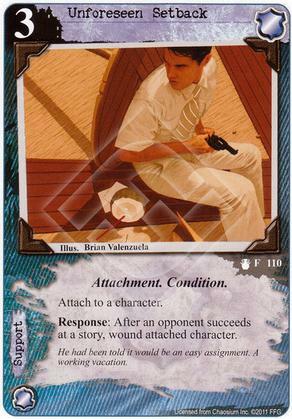 Response: After an opponent places a success token on a story where you have 1 or more committed characters, discard that success token. "History is written by the victor, but diligent study can reveal a different Truth." 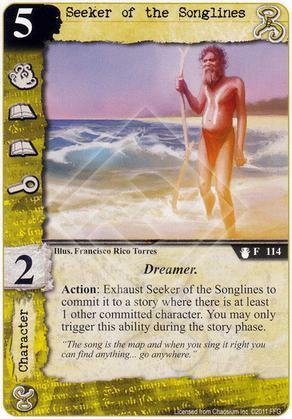 Action: Exhaust Seeker of the Songlines to commit it to a story where there is at least 1 other committed character. You may only trigger this ability during the story phase. "The song is the map and when you sing it right you can find anything... go anywhere." 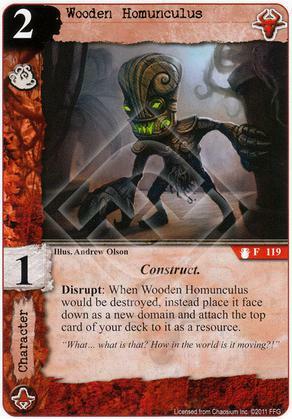 Response: Destroy a Location support card that just triggered an effect. 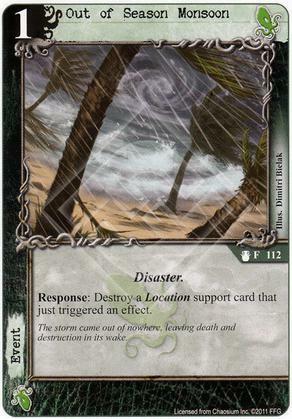 The storm came out of nowhere, leaving death and destruction in its wake. 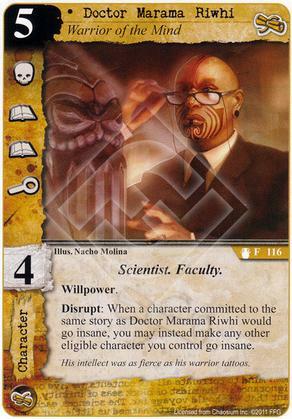 Disrupt: When a character committed to the same story as Doctor Marama Riwhi would go insane, you may instead make any other eligible character you control go insane. His intellect was as fierce as his warrior tattoos. 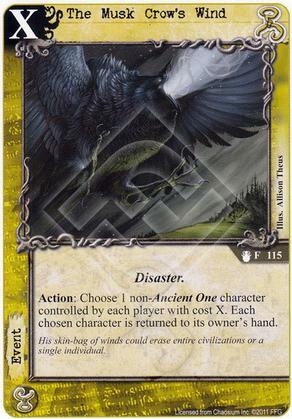 Action: Choose 1 non-Ancient One character controlled by each player with cost X. Each chosen character is returned to its owner's hand. His skin-bag of winds could erase entire civilizations or a single individual. 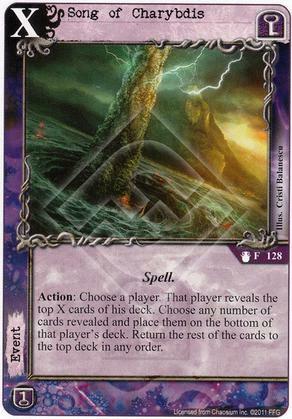 Action: Pay X to look at the top X cards of an opponent's deck. Return those cards to the top of that deck in any order. "He knew secret Truths I hadn't even admitted to myself. His eyeless gaze burned right through my soul." Response: After a character is destroyed, refresh a domain. 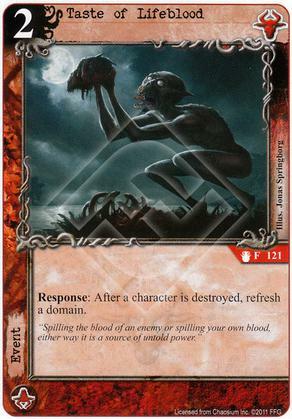 "Spilling the blood of an enemy of spilling your own blood, either way it is a source of untold power." 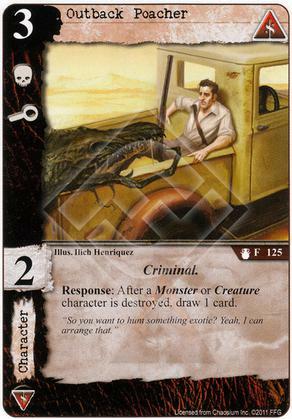 Response: After a Monster or Creature character is destroyed, draw 1 card. "So you want to hunt something exotic? Yeah, I can arrange that." 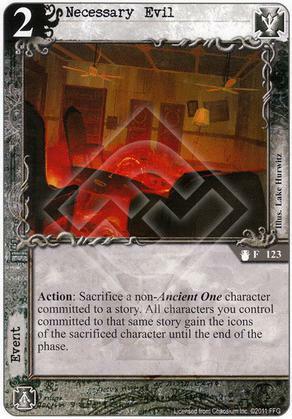 Action: Sacrifice a non-Ancient One character committed to a story. All characters you control committed to that same story gain the icons of the sacrificed character until the end of the phase. 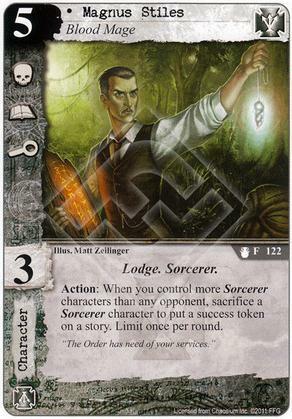 Action: When you control more Sorcerer characters than any opponent, sacrifice a Sorcerer character to put a success token on a story. Limit once per round. 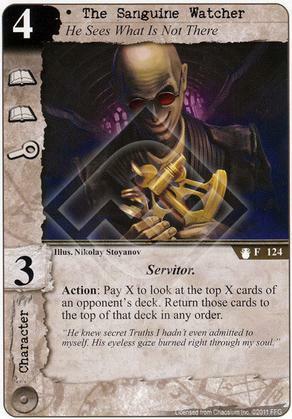 "The Order has need of your services." 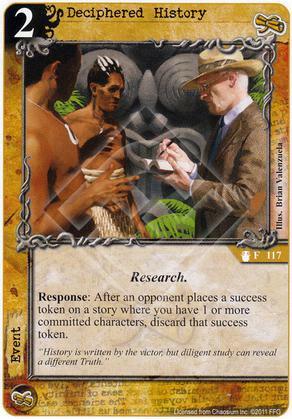 Response: After an opponent destroys a character due to a [Combat] struggle at a story where Kau'uli Warriors is committed, search your deck for a card named Kau'uli Warriors. 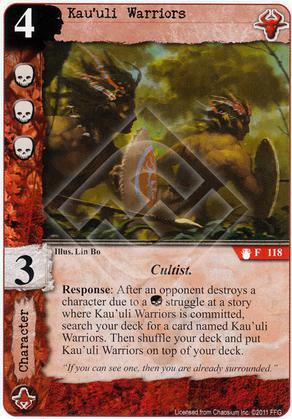 Then shuffle your deck and put Kau'uli Warriors on top of your deck. "If you can see one, then you are already surrounded." 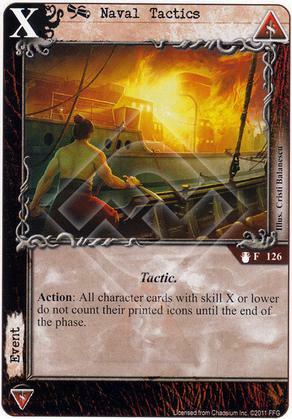 Action: All character cards with skill X or lower do not count their printed icons until the end of the phase.